The Australian Terrier (or "Aussie") was the first Australian-bred dog ever to be recognized and shown in Australia. Persistent efforts over the years produced an ideal terrier to suit Australian conditions and resulted in a rugged, hard-bitten, fearless dog that was equally at home indoors or out. 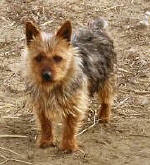 The Australian Terrier, one of the smallest of the working terriers. Alert, spirited, courageous, and self-confident. As a companion, the Australian Terrier is friendly and affectionate.